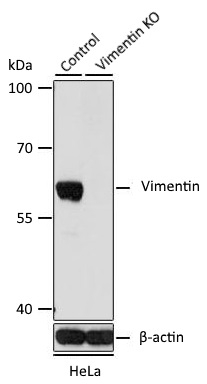 Western blot analysis of extracts from normal (control) and VIM knockout (KO) HeLa cells, using VIM Antibody (AHP2538) at 1:200 dilution. Significant research into phosphatases and kinases has broadened our understanding of these enzymes enabling exploration of their prognostic and diagnostic potential. As part of this research, CDC25 phosphatases have been shown to be overexpressed in cancers with a correlation to clinical outcomes (Kristjansdottir and Rudolph 2004). For example, CDC25B is a predictor of radiation sensitivity in esophageal cancers (Miyata et al. 2000). Many phosphatases have also been reported to act as tumor suppressors (Ostman et al. 2006). The most prominent example is PTEN, which is often mutated or deleted in tumors and negatively regulates the phosphatidylinositol 3-kinase (PI3K) signaling pathway. Germline PTEN mutations have various phenotypes, and clinical disorders caused by these alterations fall under the term PTEN hamartoma tumor syndrome (PHTS) (Yehia and Eng 2018). As PI3K-PTEN signaling pathway promotes cell survival and proliferation, it is no surprise that PTEN inactivation can initiate tumorigenesis (Cully et al. 2006). Phosphatases have also been classed as oncogenes. The first reported oncogenic tyrosine phosphatase was Src-homology 2 (SH2) domain containing protein tyrosine phosphatase 2 (SHP2). In mice, EGF stimulation induces the rapid and transient association of SHP2 with Gab1, which is followed by activation of PI3K (Diaz et al. 2012). In glioma, SHP2 dephosphorylates Ras which promotes Ras–Raf binding and activates Ras/ERK/MAPK signaling (Bunda et al. 2015). Therefore, inhibition of SHP2 could diminish the growth of gliomas in humans (Bunda et al 2015). In breast cancer, inhibition of SHP2 suppresses activation of Ras/Erk and PI3K pathways and leads to downregulation of vimentin (Zhou and Agazie 2008). 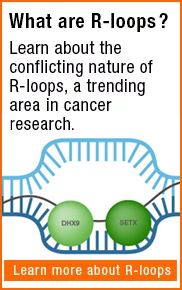 SHP2 represents a potential therapeutic target for cancer treatments. Recent advances in the understanding of phosphatases have highlighted phosphatases as critical growth-regulatory molecules that represent a new class of therapeutic targets. Bunda S et al. (2015). Inhibition of SHP2-mediated dephosphorylation of Ras suppresses oncogenesis. Nat Commun 30, 8859. Cully M et al. (2006). Beyond PTEN mutations: the PI3K pathway as an integrator of multiple inputs during tumorigenesis. Nat Rev Cancer 6, 184-92. Diaz ME et al. (2012). Growth hormone modulation of EGF-induced PI3K-Akt pathway in mice liver. Cell Signal 24, 514-23. Kristjansdottir K and Rudolph J (2004). Cdc25 phosphatases and cancer. Chem Biol 11, 1043-51. Miyata H et al. (2000). CDC25B and p53 are independently implicated in radiation sensitivity for human esophageal cancers. Clin Cancer Res. 6(12):4859-65. Ostman A et al. (2006). Protein-tyrosine phosphatases and cancer. Nat Rev Cancer 6(4):307-20. Yehia L and Eng C (2018). 65 YEARS OF THE DOUBLE HELIX: One gene, many endocrine and metabolic syndromes: PTEN-opathies and precision medicine. Endocr Relat Cancer 25, T121-T140. Zhou XD and Agazie YM (2008). Inhibition of SHP2 leads to mesenchymal to epithelial transition in breast cancer cells. Cell Death Differ 15(6):988-96.